This website is designed to assist students in understanding how cluster analysis can be used to form viable market segments. It is primarily designed as a learning resource for marketing students, but the general information and the free Excel cluster analysis template would be suitable for use by students and practitioners of most disciplines to help better understand data clustering. My background is in marketing, research and data mining – and and I have taught marketing metrics at a major university, and also run numerous websites relating to marketing and metrics – click here to see my full bio. 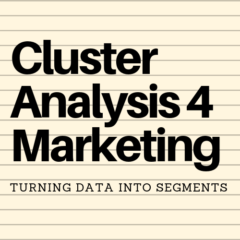 Browse through the top menu – you should find most of the information you need to run cluster analysis for marketing and segmentation purposes. Good luck with your clustering, and if you have any questions please contact me by email.